We have decided to re-release Super Mario All-Stars 1 for the Wii console. This compilation was previously released for the Super Famicom (Super NES). When I looked into who was in charge of the previous release, your names came up, Sugiyama-san and Mori-san. That’s why I suddenly asked you to join me today. 1Super Mario All-Stars: Released in Japan for the Super Famicom system in July 1993. In Europe it was released for the SNES in December 1993. It includes four games: Super Mario Bros., Super Mario Bros. 2, Super Mario Bros. 3 and Super Mario Bros.: The Lost Levels. This really caught me off guard! (laughs) It was quite a long time ago. (laughs) How did it feel to play it after so long? It’s fun to play even today, and my fingers move all on their own! 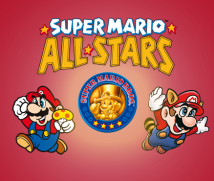 Did you remember a lot about developing Super Mario All-Stars 17 years ago? You’re both still active on the front lines of development, but what was each of you doing back when you made Super Mario All-Stars for the Super Famicom? Someone else was the main director. I lent support as an assistant director and designer. I was designer in about my third year with the company. Do you remember how it was decided to make Mario All-Stars? If I remember correctly, Miyamoto-san brought it up a little while after development of Super Mario Kart2 had ended. He wanted to create a value pack combining all the Super Mario series games. I think the idea was to include the Lost Levels3, a game not many had played on the Disk System, thereby giving people another opportunity to play it. 2Super Mario Kart: A racing game released in Japan for the Super Famicom system in August 1992. In Europe it was released for the SNES in January 1993. 3Super Mario Bros.: The Lost Levels: An action game released in Japan for the Family Computer Disk System in June 1986. In Europe it was first released as part of Super Mario All-Stars for the SNES in December 1993. So it began with the idea of taking the four Super Mario titles for the Famicom, remaking them for the Super Famicom, and offering them together as a great deal. Are the specifications for Super Mario All-Stars still around? They’re gone. When I heard about this interview, I looked all over, but came up empty-handed. Sorry. All I could find where I worked on it were a few scribbles on a scrap of paper. We still wrote things down by hand back then. What’s really miraculous is how Nakago-san4 has kept materials from over 25 years ago. Since nothing remains from that time, please do your best to recall what happened 17 years ago. (laughs) How did development of Super Mario All-Stars begin? 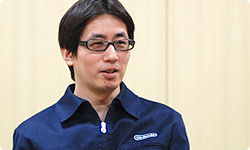 Did it begin with analysis of the programming of Nintendo’s own games? 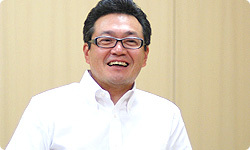 4Toshihiko Nakago: President of SRD, Co., Ltd.
SRD5 did the original programming, so... 5SRD Co., Ltd. is a company that was founded in 1979. They program video games and develop and sell CAD (Computer-Aided Design) packages. 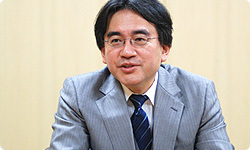 The company is based in Osaka and its Kyoto office is located inside the Nintendo headquarters. SRD was in charge of the programming for the 2D Mario games starting with Super Mario Bros. Right. So that made some things easier. The people who created the original games were involved, so you could consult the actual developers. But all the data for the graphics weren’t still around, so I doubt it was easy work. Mori-san, as a designer, what did you begin work on? The first thing I was told to do was update the graphics. You were going to run Famicom (NES) software on a Super Famicom, so you needed to update the old graphics. But weren’t you a little intimidated? Super Mario Bros. is Nintendo’s flagship title, so you wondered if it was alright for you to touch it. Yeah. And if I remember correctly, the first thing I was asked to do was redraw the first Bowser’s castle that appears. We have decided to re-release Super Mario All-Stars 1 for the Wii console. This compilation was previously released for the Super Famicom (Super NES). There weren’t many components to that castle in the original Famicom version. For the Super Famicom, you could put together a lot of parts. but we had quite a lot of parts to use . That castle is one of the first things players see, so I was under a lot of pressure, and I spent a lot of time on it. Mario All-Stars has four games in it. Which ones did you work on? I worked on the backgrounds, or BG, that’s how we called it back then, for the first Super Mario and The Lost Levels. I was responsible for using the increased number of colours available and lots of tiles to redo the BG graphics one by one in order to update them for the Super Famicom. You just used the abbreviation BG. Perhaps I should explain. Back in the days of the Famicom, Super Famicom and the first Game Boy, we abbreviated the word background to BG. You made it by filling up the space with 8×8-pixel components called tiles. Right. I think I did all the objects and about half the BG for Mario 2.6 6Super Mario Bros. 2: An action game released in Japan for the Famicom system in September 1992. It was released in Europe for the NES in April 1989. Maybe I should also explain what we mean by objects. Objects are those things like Mario or Koopa Troopas that move around in front of the BG. They were made to be moved on a scale of one pixel, so we called them moving objects. Abbreviate that and you get “OBJ” or “object.” Back then, we were making games using abbreviations like BG and OBJ that the average person wouldn’t understand at all. I was a developer back then, too! (laughs) To sum up, you could do a number of new things with the Super Famicom, like use more colours and components, so it was your job to make richer graphics in accordance with that. You weren’t simply creating a copy, you had to rework it for the Super Famicom. Right. In the collection, Super Mario and The Lost Levels, in particular, were different from their originals. We fashioned the characters somewhat after those in Super Mario World for the Super Famicom. Yes, that’s right. So we even put a black outline around Mario.